Resolution of the Tokina AT-X M35 PRO DX AF 35mm f/2.8 Macro is best on the Canon EOS 7D, especially at wider apertures. Minimal distortion, which is visually difficult to detect. Very limited vignetting and lens shading, with the defect largely absent at apertures f/4 and above. Brightness, with a measured transmission score of 3 T-stop. This has the lens underperforming against some macros that can brag of brightness and apertures greater than f/2. Autofocus, which does not work on some digital Nikon models. Tokina is not the only manufacturer to produce a unique prime standard macro lens. Pentax has the nearly identical, at least in specifications, smc DA 35mm f/2.8 Macro Limited. 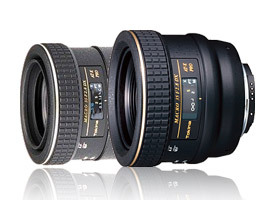 Nikon also competes with its AF-S DX Micro NIKKOR 40mm f/2.8G. Price, marketed at about $600 (USD), it can be found for half that price on a number of web retail sites like Amazon and B&H. This makes it a bargain against the $700 priced Pentax smc DA 35mm f/2.8 Macro Limited. Better resolution, especially against Pentax’s 35mm macro, and at the widest apertures of f/2.8 and f/4. Slightly better control of lens shading, especially against the Nikon AF-S DX Micro NIKKOR 40mm f/2.8G. The Tokina AT-X M35 PRO DX AF 35mm f/2.8 Macro for Canon and Nikon, left, has the best control of lens shading of the bunch, especially compared to Nikon’s Micro NIKKOR 40mm f/2.8G. Controlling chromatic aberration, making it particularly useful in high contrast environments. Price, with a suggested retail value of $280 (USD), it is the most affordable lens of the three. Photographers considering an investment in a Pentax camera and pool of lenses will be happy to know the smc DA 35mm f/2.8 Macro Limited ran mostly even with the image quality of Tokina’s 35mm f/2.8 macro and Nikon’s 40mm f/2.8 micro. The Pentax lens’ biggest advantage is its size, measuring about 4.5 centimeters in length and weighing a feather-like 215 grams, makes it an ideal piece of optics for photographers who are looking to lighten the load of their camera bags. The Tokina AT-X M35 PRO DX AF 35mm f/2.8 Macro for Canon and Nikon is lightweight and compact. It caters to photographers looking for a lens that can be tasked with performing a number of jobs including portrait photography, detailed close-up shots, in addition to candid and landscape photography. Its image quality is on par with competitors, and it excels at containing unwanted defects like vignetting, chromatic aberration, and distortion. As an added bonus, it’s affordable, making it a welcome addition to any Canon or Nikon users’ kit of lenses.